• Shine on! This exclusive formula, with Pearl Extract & 5 Natural Oils, works  to bring out your hair's natural shine! 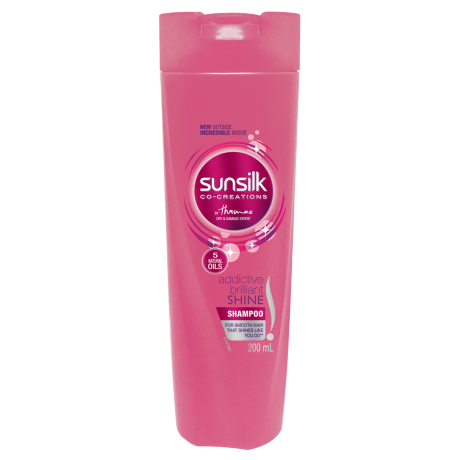 Sunsilk Addictive Brilliant Shine shampoo 350ml for For smooth hair that shines like you do** **With use of shampoo and conditioner vs non-conditioning shampoo. Ready? Massage onto wet hair and then rinse thoroughly. Repeat application and use daily. For even more incredible hair, why not combine it with Sunsilk Addictive Brilliant Shine Conditioner? Water, Cetearyl Alcohol, Dimethicone, Stearamidopropyl Dimethylamine, Behentrimonium Chloride, Pearl Extract, Argania Spinosa (Argan) Kernel Oil, Helianthus Annuus (Sunflower) Seed Oil, Prunus Amygdalus Dulcis (Sweet Almond) Oil, Olea Europaea (Olive) Fruit Oil, Cocos Nucifera (Coconut) Oil, Glycerin, Amodimethicone, PEG-7 Propylheptyl Ether, Cetrmionium Chloride, Cyclotetrasiloxane, Dipropylene Glycol, Lactic Acid, Sodium Chloride, Disodium EDTA, Methylchloroisothiazolinone, Methylisothiazolinone, Phenoxyethanol, Fragrance, CI 60730, CI 16255.